More than 78,134,097 beer lovers served! Hours: Monday-Saturday 11:00am-midnight, Sunday noon-10:00pm. 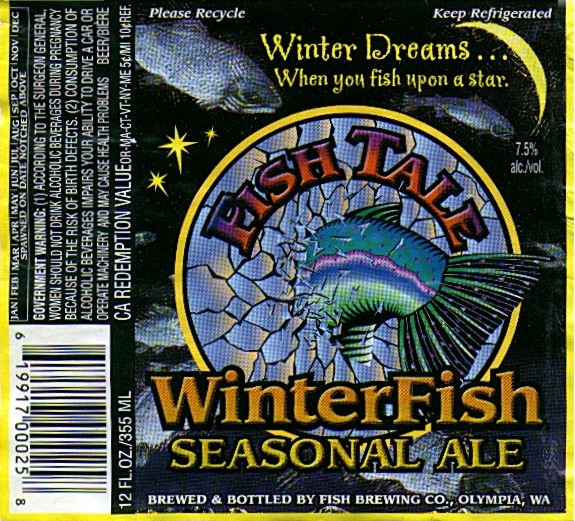 Fish Brewing and Leavenworth Brewery merged in 2001. 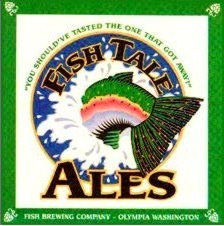 Fish also operates a pub at 2019 Hewitt Avenue in Everett WA. Bright deep red. Moderate dense head. Huge body. Huge caramel malt. Huge dark fruit. Huge toasted wood. Huge spicy hops. Huge beer. Vanilla tops off the finish. Deep orange, hazy. Thick head. Spicy, citrusy, intense hops. Subdued compared to flavor. Big smooth body. 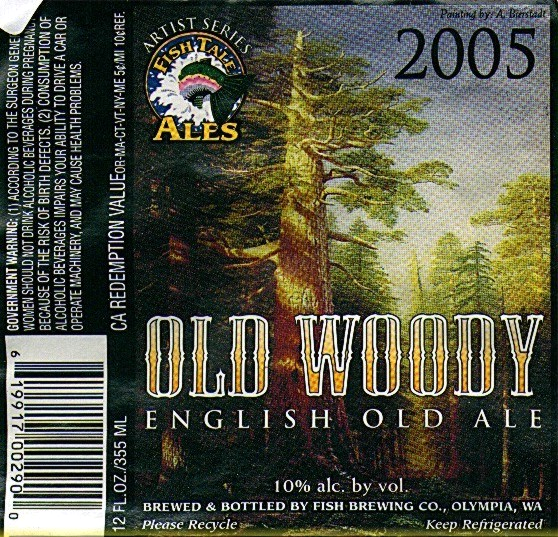 Big spicy, smoky hop character; the bitterness initially burns like jalapeño pepper. Lots of caramel malt for support. Good well-balanced complex beer. Sure doesn't taste like it has 10% alcohol. "October 2005...10 types of hops, 100 IBU". Dark red-brown opaque. Thick head. Big dark caramel, and wheat. Medium body, fizzy. Huge dark caramel and dark raisiny Munich malt flavor. Light body, really fizzy. Big malt sweetness, mildly grainy but fairly toasty too. Sweet malty finish with a hint of spicy hops. Dark dark brown, moderate head. Oaky aroma, darkly malty. Big body, richly brown-malty, some vanilla in the finish. Aged in oak. Thanks to Steve Olson for bringing this bottle from Oregon! Deep golden-amber, some haze. Thick head. Medium-big body, creamy. Massive piney hop character, resiny. Big malty base for balance. Yellow-amber, great white head. Same perfume as Pale, but not as strong. Thick, smooth. Flavor subdued, mild bitter finish. Medium-big body. Creamy and fizzy. Tart. Malty. Reasonably bitter. Some (odd) peach flavor. Oaky. Very oaky at the end. Interesting beer. Winner of a 2006 homebrew contest. Light and sweet. Toasty and bready. Mild spicy clove character. Medium body, fairly fizzy. Big wheat malt flavor. Fairly sweet. Really clean, with a hint of smoke in the finish. Bright red-amber. Thinnish head. Bottle-conditioned. Huge dark caramel malt. Some alcohol. Some fruity hops. Big body. Really chewy. Lots and lots of malt. Mildly bitter. Good dark fruity character along with dark caramel. Hint of milk chocolate. Good beer, but still fairly young. "Batch #5, bottled November 2004". Light body, fizzy. Lots of butter. Sweet malt. Amber, slight haze, thick head. Very mildly spicy aroma. Medium-big body. Richly malty. Lots of fruitiness...bananas, berries. Mild alcohol sensation and warming. Thanks to Steve Olson for the bottle! Medium body, fizzy. Nice black coffee flavor, with a good malt sweetness and an earthy hop. Smoky. Very very very dark red, good brown head. Some coffee in aroma. Coffee flavor, and alcohol. Weird balance in favor of alcohol. Big caramel. Big fruit. Big alcohol. Big body, silky smooth. Big earthy caramel maltiness. Powdery dryness. Nicely warming. Caramel malt and spicy hops. Medium body, fizzy. Huge caramel malt character. Smoky, earthy hops, and maybe some DMS. Medium body, creamy. HUGE floral hop flavor, almost perfumey. Fairly bitter. Tasty, but not as tasty as Hodgson's. Massive. Massively roasty. Massively malty. Massively black. Big oaky vanilla note. (Batch #3, aged in cabernet oaks.) Black, thick brown head. Dill aroma on a roasty chocolate background. Medium-big body, high carbonation, hugely roasty, very mildly sweet. Black fairly dry finish, warming all the way. Thanks to Steve Olson for the sample! Some spicy hops, lots of caramel. Medium-big body, fairly fizzy. Huge spicy hops! Fairly bitter, but LOTS of spicy hop flavor and lots of malt to back it up. Very deep red, not black. Eeeenormous brown head. Perfume aroma with black malt. Quite burnt flavor...ashtray. (That's a good thing.) Still some perfume in flavor. Late astringency OK. OK carbonation bite and sweetness. Medium body, fizzy. Huge fruity hop flavor up front. Nice toasty/caramel malt behind that. Hint of diacetyl in the finish. Golden-amber, high carbonation, thick head. Citrus hop aroma. Medium body, high carbonation, good malt background for the Cascade hops. Drying finish. Red-amber, good head. Very perfumey nose. Thin, bitter. BIG bitter finish. Perfume aroma detracts. Medium-big body. Creamy. Massive green hop flavor, like chewing on leaves. Spicy, and fairly bitter. Great big caramel malt base, very nicely balanced. Bright amber. Bottle-conditioned. Thick head. Hops: very spicy, fairly citrusy, a little earthy. Medium body. Fairly fizzy. Big citrus hop flavor, fairly bitter. More malt, more body would be nice. More malt, more body would be nice.